Early celebration parties in Zimbabwe kicked off even before the polls closed in one of the country’s most peaceful elections of recent times. Amid high expectations from both sides, and with a high possibility of a presidential run-off, the next 48 hours will prove to be the real test. On one of the few patches of green grass in the Harare suburb of Gun Hill, Ratidzo Redzo was taking selfies of her pinky finger. 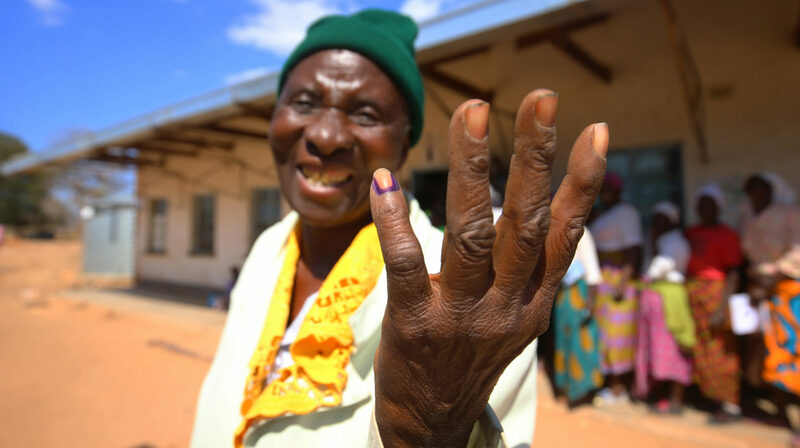 She had just voted in one of the five large khaki-coloured tents that served as a polling station at a road junction, and there was black voters’ ink on her nail. Redzo is very pretty, but not entirely happy. The bright 26-year-old history honours graduate was the only one to be capped by former president Robert Mugabe when she graduated first class in 2015, but so far all she has been able to find to make money is a job behind a counter at a Chicken Inn. Even though she’s lucky to have a job, she thought things could have been better. It was her first time voting in an election, even though she was eligible to do so five years ago. Redzo was referring to the cash crisis that was brought on by a weakening economy, and which saw the introduction into circulation of bond notes at the end of 2016. Not far from there was a much older woman sitting on the grass, clad in a pink dress, with her three-year-old grandson by her side. She concurred. The 53-year-old only gave her name as Howe. She’s working as a secretarial assistant, but complained that wages have been frozen for the past 10 years. The Zimbabwean bond notes with their fluctuating rates against the dollar are diminishing it even more. Now people are sleeping in queues by the bank to get cash. “Before, they would pay you US$200, but now they pay you the same thing in bond notes and it is much less. We want the new leader to change everything,” she said. American dollars are worth roughly between $1.30 and $1.60 in bond note currency, depending on how and when the exchange is done. All Zimbabweans agree that they want to see their country change to become economically prosperous again. The long voting queues – and, according to early figures, the high turnouts – were testament to that. So far, they’re doing good. The run-up to elections day was more peaceful than it had been in years, and supporters from both the major parties, the MDC and Zanu-PF, have shown tolerance. Swarms of foreign and local observers have been allowed into the country and did the rounds on elections day. They did note that at some polling stations MDC agents were denied access, and that campaigning still happened on Sunday while the Electoral Act forbade this. All in all, however, there was cautious optimism. Now the world will be watching the outcome. The deadline for the results announcement is Saturday 4 August, but observers expect it to be known by Wednesday – unless there is foul play. Many of those in the know say there is a big possibility of a run-off. Zanu-PF is still popular in their rural strongholds, their organisation and campaign machinery superior, and their largesse unequalled by any of the opposition. President Emmerson Mnangagwa, who declared after his take-over in November that Zimbabwe was open for business, has a lot of appeal as an experienced statesman, and is perceived by many as a decisive hand when it comes to driving development. The MDC, on the other hand, claims to offer the real change that Zimbabwe needs, and its 40-year-old presidential candidate Nelson Chamisa appeals especially to the youth. He also offers a clean break from the past rule of Mugabe (we won’t mention their pre-election cosying up of sorts). In a poll done by Afrobarometer – the only pre-elections one done in Zimababwe – 40% of respondents said they would vote for Mnangagwa and 37% said they would vote for Chamisa. Twenty percent of respondents didn’t want to disclose their choice, but these could go either way. Dr Webster Zambara is a senior project leader at the Institute for Justice and Reconciliation in Cape Town, which conducted the Afrobarometer survey. He has been in Zimbabwe observing the elections with the Zimbabwe Human Rights NGO Forum and said candidates should recommit to peace in the event of a run-off. “Zimbabwe only had one run-off election before, which was marred by violence, and it also followed a generally peaceful election in 2008. Many people fear that history may repeat itself in the event a run-off happens. “Our most recent survey showed that 43% of the population fear election violence.